Although they came before the huge surge of interest in pro football, Don Hutson cards and memorabilia remain popular with collectors. The first modern receiver, Don Hutson was a top player for the University of Alabama and the Green Bay Packers. However, while Hutson is recognized as one of the greatest receivers in NFL history, his cardboard options are limited. 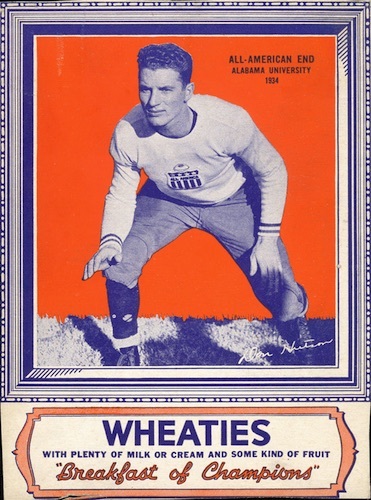 Don Hutson first made his name at Alabama as an All-American and was noted for his speed and change of pace. Following his graduation in 1935, Hutson sought to continue his football career in the NFL. Because this time pre-dated the NFL Draft, Hutson was permitted to join any team. He actually signed with both Brooklyn and Green Bay but ended up on the Packers as that contract was signed earlier. Hutson was a two-time MVP and an eight-time First-Team All-Pro selection with the Green Bay Packers. He also won three NFL titles. Shop for Don Hutson Cards on eBay. Despite all this gridiron success, there are simply not many Don Hutson cards available to collectors. 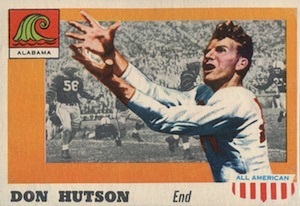 The football card world was still in its infancy when Hutson entered the league and the few pre-1950s sets that were released did not include him. Hutson's first official card was not issued until 1955, roughly a decade after he retired. Hutson also did not sign much for card products, with the majority of his pack-pulled autograph cards being cut signatures. Don Hutson passed away in 1997. The earliest known "card" for Don Hutson came on the back of Wheaties boxes in 1935. The hand-cut cards honored the 1934 All-Americans and measured around 6" x 6-1/4". The cards don't surface often and can command huge values in good condition. The primary card for Don Hutson is found in 1955 Topps All American. The college-themed released by Topps came out ten years after Hutson retired from the NFL and twenty years after he finished college. The value for the Don Huston rookie is further increased as his card is one of several short prints.